Welcome to Palapas Ventana, the Best of Baja!! We are an Ocean Adventure Resort in La Ventana Bay in the Sea of Cortez, Baja Mexico. 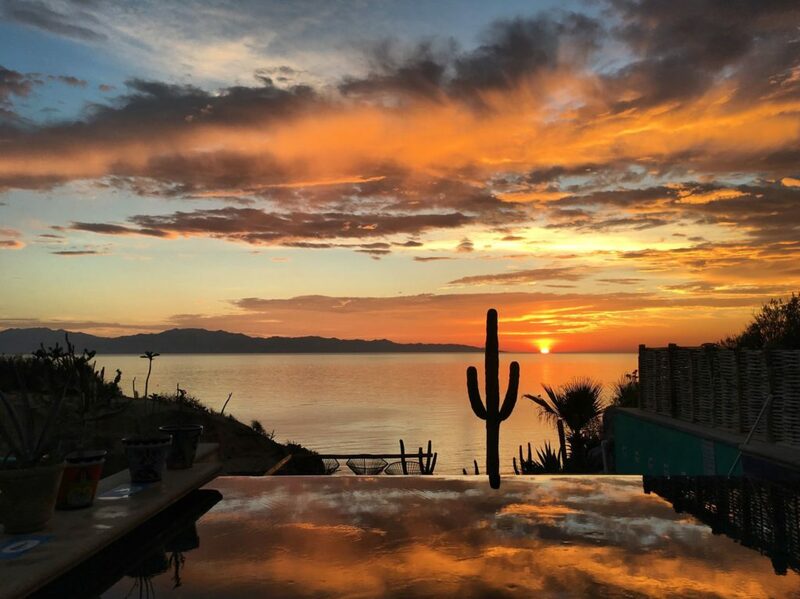 We have world class Spearfishing, Fishing, Kiteboarding, SCUBA…..or just relax and enjoy incredible turquoise water, amazing sunrises and sunsets, friendly Mexican culture, foods with unforgettable flavors, and a time to just “be in the moment”. Join the Hatler family on a barefoot adventure you’ll never forget..the only hard part is leaving. Come get kiteboarding lessons and vacation packages with Palapas Ventana. This winter is looking like another awesome wind season – and the best time and place to learn to kiteboard! We offer personal, professional, and customized instruction, and utilize the best tools available to make this happen. Secondly, we use motorized land and water rescue assistance for safety. Join us for 3 days of professional kiteboarding instruction, all kiteboarding gear and wetsuits plus 5 nights acommodation in a casita with AC, 2 delicious meals a day, use of bikes, snorkel gear, pool, jacuzzi, kayaks and a commemorative T shirt. Grab a spot by emailing contact@palapasventana.com, calling 612 114 0198, or walking in! Welcome to the best Diving of the year at Cerralvo – right now no wetsuits needed, 100 foot visibility and a very high chance for daily Giant Manta Ray Encounters – come snorkel or SCUBA with our professional guides while the water and animals are at their finest!!! We’ll show you the best spots, look for dolphins and whales in between, have lunch in a cave on a deserted beach and let you ride the SUBWING! Walk in, email contact@palapasventana.com or call 612 114 0198. Like hooking up Tuna, Dorado and Wahoo? Come and get it now cuz – the fishing is on the Hook – we net live sardinas included in the price. Captain Yoni speaks English and Fishing and is ready to give you a full 8 hour panga day – filet and ziplock service included plus our restaurant is waiting to make sashimi, sushi, ceviche or grill your catch while you relax poolside with a drink. Book a trip by walking in, emailing contact@palapasventana.com or calling us 612 114 0198. Want to feel more confident next time you get held underwater on a surfing or kiting wipeout? Want to dive deeper for longer to see bigger fish and silently swim closer to them? Want to round out your waterman skills and achieve your personal best in a zen like sport that is filled with both relaxation and exhilaration? Come and Join Palapas Ventana and our experienced instructors in a 1 to 4 day course on freediving with IANTD certification – expect depths achieved to be around: intro – 10 m, advanced 20 m, and master 20 m.
Includes breathing techniques static and dynamic apnea pool training, classroom sessions, and panga line diving offshore – grab a spot by emailing contact@palapasventana.com, calling 612 114 0198, or walking in! Road Runner Shuttle is ready to safely and reliably transport you!! Cabo airport, La Paz airport or town runs- Book the whole van or just a seat- Our Toyota Hi Aces have AC, giant luggage rack, on board drinks bluetooth and charging stations and our local Drivers speak english and greet you right off the plane – contact us for our beat prices.